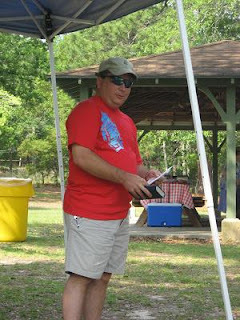 Our church recently had our Sunday worship service at the local state park. 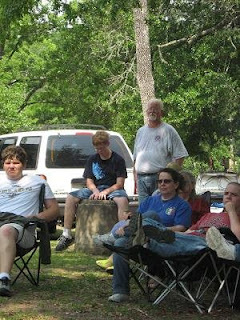 Several of us camped out the night before and had a great time. The late night bonfire chat was way better than any David Letterman or Jay Leno show. But anyway.... the service. I found this very cool because we were positioned in a semi-circle and I could finally see the congregation as Pastor Scott preached, as opposed to only being able to see the back of Chris Fraser's head or the choir, face-on, when I sit in my normal pew on a normal Sunday. First of all, here's Scott preaching. Nothing too unusul except for his attire. Yes, Scott, that is a scowl on your face. Yes, it is often aimed at me, not a terribly unusual sight. 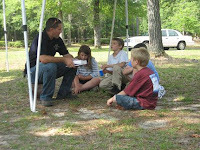 Here's Billy giving the children's sermon. Now here's where I begin to notice things that I don't usually get to see. I spy a couple of people gently falling into a deep slumber. Is that what Scott sees each week?? 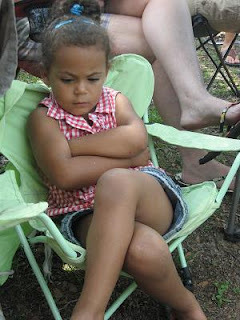 I see someone developing an attitude. Getting her toes stepped on maybe? Hey! 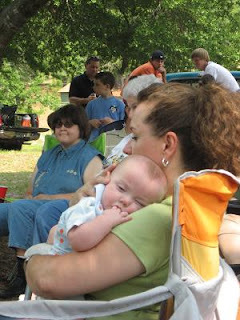 Looks like Gramma may have beaten him to the snoozin' point!